Father's Day is the third Sunday in June. Fathers Day Activities, such as those special songs, poems, activities or gifts made by a preschooler and given to Dad, Grandpa or other caring male is priceless! Let the Fathers Day Activities Theme planning begin! This Theme page is filled with some preschool activities and ideas for your classroom. Some of the activities on this page are the same as the activities listed on the Mother's Day Theme paged, but changed for Dads! 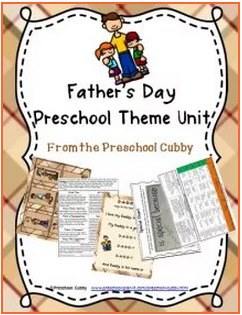 You can either scroll down through this page to see all of the preschool activities for your Fathers Day Activities Theme or click the link below to go to specific preschool activity types you are looking for. for you to print, laminate and use! Have the children dip their hands in fingerpaint and then press their hands side by side (with both thumbs next to each other) and press down. Remove paper to dry...let them continue free style fingerpainting! Which are a part of me. Materials Needed: Fingerpaint and paper, a tub of soapy water and towels! The children dip one foot into the paint and step on the paper. "I'm Following in Your Footprints" with a picture of the child on the card. The children make hand prints on paper (as many as they want) and when dry, you can frame it or make a construction paper border around it and laminate it. You can’t bring back what’s past. The children print whale stamps on the paper. When dry, write "You're A Whale of a Dad!" and have the children help you to glue the paper around the can. Great can for holding their keys, tools, pens, etc. Materials Needed: Small gift boxes (1 for each child); paint; Hershey's Kiss and Hug chocolate. The children paint the box and when dry add some Kisses and Hugs to the box and cover it! Here is a poem for the box--I'm not sure who wrote this poem, but it's great! It's filled with hugs and kisses, as sweet as sweet can be. Add dollhouse sized people to your block area for some family fun building! Well, of course it's DAD! However, do the children know their Dad's actual first name? Ask each child their Dad's name (have the list of names available so that YOU know them!) and write each name down on a piece of chart paper. The children love talking about their Dads! Ask the children what types of things their Dads do. Where do they work? What types of things do they do at home? I'm sure you'll have some funny stories to share! Ingredients and Items needed: Any items you want to use for a trail mix--be aware of allergies! Perhaps have some cheerios, raisins and pretzels in separate bowls. The children add one scoop of each snack into a baggie and add a "For My Dad" note to give to Dad with a card. Add dollhouses, furniture and vehicles for the dollhouses to your dramatic play area. Ask your children what their Daddy does for or with them and then encourage them to paint a picture of that at the easel. Print on the paper what the child said about their Dad. Fathers Day Activities Theme Large Group Games that help build their muscles while they have fun together! Thank you to Sheila from NC for these ideas! Try playing Father May I (a twist on Mother May I) or Father, Father, Son (Daughter) (a twist on Duck, Duck, Goose)! Click here to learn more about my 30-page Father's Day Resource Pack! Fathers Day Activities Theme ideas to help your preschoolers develop math skills and those small muscles in their hands! The children rip out or cut out pictures that remind them of their Dad or family and glue it on a collage. Be sure to ask them why they chose each picture. That way, when they bring the collage home, they will tell their families how each picture reminds them of home! In advance make (print pictures from online) pictures of a Dad doing daily activities (driving, cooking, working, etc.). Make 2 of each picture, and laminate. 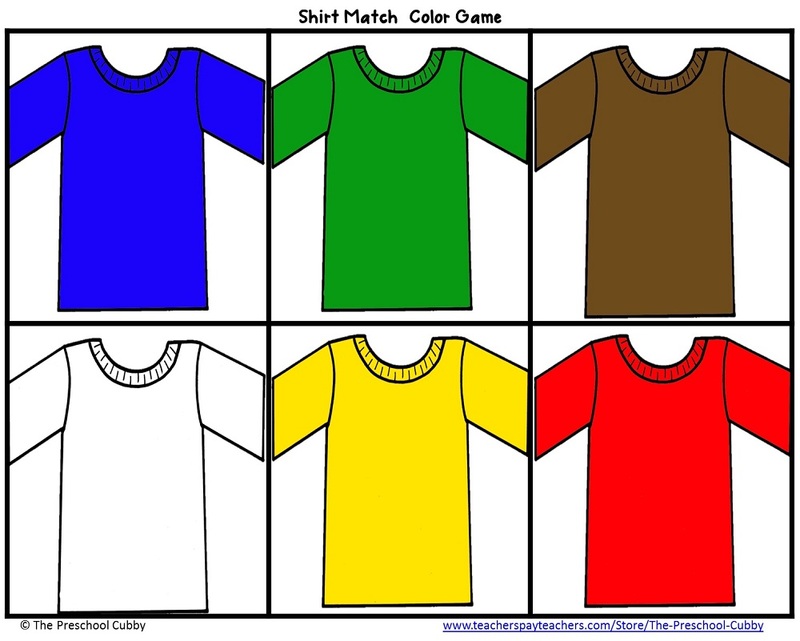 The children can either place them face down on a table and play a memory game with them or they can leave them face up and find the matches, depending upon their level of ability with this type of activity. In advance, cut out from magazines (or print out from online) pictures of family members: Moms, Dads, babies, etc. Print out several of each. Look at and discuss the pictures with the children. Then ask how many Dad pictures are there? How many babies? I love my Daddy, he's the best. My Daddy is a great one. And Daddy is his name-o! Fathers Day Activities Theme Ideas for the Senses! Place shaving cream and craft sticks in your sensory table today for the children to shave with! Add small plastic balls for them to put the shaving cream on and then use the sticks to shave with! 1. Mix cement as instructed. 2. Pour into the round pans. Let sit until it is firm enough for a print to stay in it. 4. Trace child's initials and date into it. 5. Child presses some small toys around the footprint. 6. Let set. Most cement needs to be "cured" by covering with water. Read directions and do this. 7. Let set until hard (a few days) and then remove the stones from the pans. They are great stones for a home garden, on a deck, end of a driveway! This is not as complicated as it sounds! When I first saw this activity, I thought "THERE IS NO WAY...!" But it was easy and fun. We did it outside and the kids were able to run around in the playground barefoot for a while! Have the children fill their pot with soil until just about full. Place a heart shaped cookie cutter on the soil. Cover the seeds with more soil. The grass will grow into a heart shape! EXTENSION: Before planting, have the children decorate the outside of the pot with markers, stickers, etc. and then glue on a picture of the child to the pot. Add your favorite fathers day poem to a heart shaped paper. Hole punch the heart and tie around the pot with ribbon! 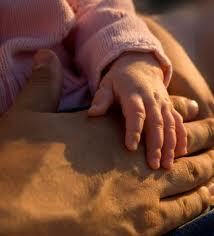 Fathers Day Activities Theme Ideas for your Writing Center! The children trace and cut out 2 hand prints with the stencil(or you can have them pre-cut). The children trace their own hand and you help them cut out 3-5 of their own hand shapes. Write each of these ideas on the child sized hand prints. The children decorate each one with markers and stickers. Staple these inside the larger hand prints for a coupon book. You can write something on the front such as "Giving Dad a Hand" or other saying. Or, have the children practice writing "Dad" on the front! Materials Needed: Construction paper, markers, scissors, pre-cut letters D-A-D OR, I like to have the word "DAD" posted at the writing table for the children to print it themselves. Over the letter A, have the children glue on a small picture of themselves. They decorate the placemat with markers. You laminate it! Just for you from me. While you drink some juice with me!